“Linkin Park are extraordinary musical artists who combine genres to create their own sound. It only seems fitting for us to collaborate with them on this unique film. It was a privilege to work with them on this music trailer,” commented Bekmambetov. 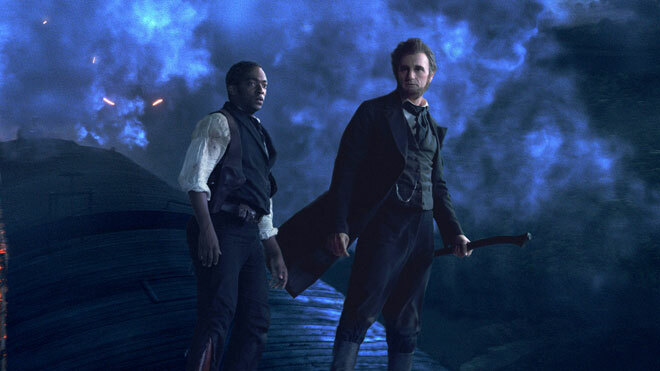 “Abraham Lincoln: Vampire Hunter” will be released in local cinemas on July 4. The song “Powerloess” will close Linkin Park’s upcoming album, Living Things, which is co-produced by Rick Rubin and Mike Shinoda and will be released June 26 on Warner Bros. Records. Visit the Facebook pages for Linkin Park www.facebook.com/linkinPark and “Abraham Lincoln: Vampire Hunter” www.facebook.com/vampirehunter to view the music trailer. Linkin Park, the award winning band comprises of lead vocalist, Chester Bennington, drummer/percussionist, Rob Bourdon, guitarist Brad Delson, bassist Dave 'Phoenix' Farrell, DJ, programmer Joe Hahn and Mike Shinoda - lead vocals, keyboards, guitar. The song “Powerless” will close the release of their next album, Living Things, which is co-produced by Rick Rubin and Mike Shinoda. “Abraham Lincoln: Vampire Hunter” is based on the novel by Seth Grahame-Smith, the film is a delightfully revisionist take on the backstory of the 16th President’s life that sees him training to fight a vampiric scourge as he rises through the political ranks of the United States as he secretly slays bloodthirsty vampires by night. “Abraham Lincoln: Vampire Hunter” opens July 4 in 2D and 3D cinemas nationwide from 20th Century Fox to be distributed by Warner Bros. Comments or suggestions about "Linkin' Park in "Abraham Lincoln: Vampire Hunter" Music Trailer" is important to us, you may share it by using the comment box below.